Another Android Tablet is being launched in Japan. 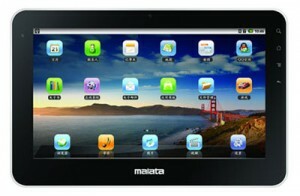 The Malata T2 Android tablet is the newest in the breed of Android tablets flooding the market. The Malata T2 runs Android 2.2 and has a 1GHz NVIDIA Tegra 2 Corex-A9 dual-core processor which makes it faster than its competitors. It also has 1GB or RAM and about 16GB of memory for storage. It comes with a 10 inch screen with a resolution of 1024 x 600 pixels and also includes a microSDHC card slot for expanded memory and even RAM to up to 32GB. It can run flash 10.1 content and has Bluetooth 2.1+EDR, Wi-Fi as well as a 1.3 megapixel camera. It is priced at approx $592 which is a little more expensive than the mighty iPad. How to buy this tablet online? does the firm give any warranty for international customers? I think you do get warranty regardless of where you live, if things break you will have to ship it at your cost. Just google for this tablet.